Don’t you just love wrens. They are those cute little birds that announce their presence with their loud boisterous singing or calls. Sometimes that is the only way that you know they are there as they can be pretty secretive birds. 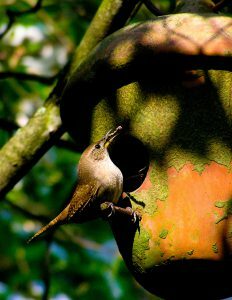 Most people only know about the House Wren which is a common backyard bird throughout most of the United States and into Canada. 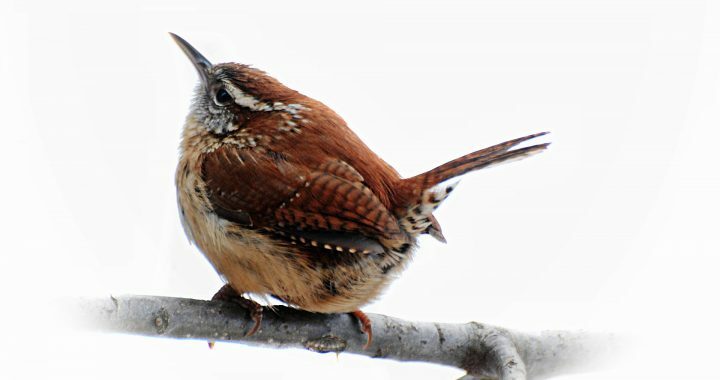 However, did you know that there are ten types (species) of wrens found in North America. I personally have seen nine of these species over the years as my husband and I do a lot of traveling. Of course whenever we travel, bird watching is always a must if my husband has anything to say about it 😉 ….and I do not mind because I get to see a lot of bird species that I would never have seen otherwise such as the different species of wrens. So what are all the different species of wrens? Read on…..
1. House Wren – (4.75 inches long with drab plumage) as mentioned earlier, this wren is a common backyard bird during the spring/summer months, that has no problem nesting close to homes or in nesting boxes. 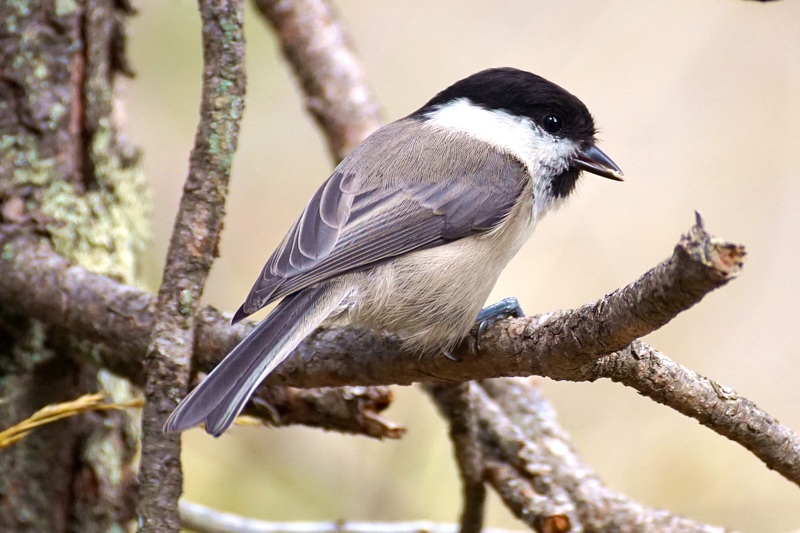 They like to make their nests in almost any type of cavity that they deem appropriate such as an old boot, a hanging flower basket, a watering can, or a decorative birdhouse. House Wrens also can be found open forests, parks, gardens, and towns. They winter in the southern part of the United States and into Mexico. If you want to attract House Wrens use nesting boxes with a 1 1/8 inch entry hole. If the hole is any bigger you will get House Sparrows. House Wrens eat insects and spiders. Carolina Wren – (5.5 inches in length, short bill and stocky with bright reddish-brown plumage). I love this wren because of its throaty, musical song that sounds so pretty, and not just during breeding season (like most birds who only sing during this time). The Carolina Wren can be found mostly in the Eastern United States and in Central America. It is a little brighter in color than the House Wren and always reminds me of a chipmunk with a tail. Carolina Wrens can be found in gardens, towns, open forests, farmland. They feed mostly on insects and spiders during the summer months and will come in to feeders for sunflower seeds and suet feeder during the winter months. 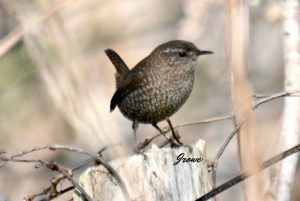 Winter Wren – (3.1 to 4.7 inches long with a short tail and thin bill and dark brown plumage) this wren breeds in the more north eastern parts of North America in coniferous forests. They winter in the south eastern half of the United States. We live in Kentucky and are lucky to get them in winter. You can find them in dense woods but they are very secretive and usually stay very close to the ground in thickets. Winter Wrens eat mainly insects and spiders and in winter will eat berries and can be lured in to suet feeders if their food supply is scarce. Pacific Wren – (3.1 to 4.7 inches long with a short tail and thin bill, dark plumage) this is actually the western version of the Winter Wren. 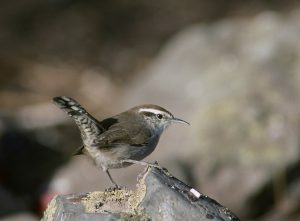 Both are pretty similar in size and appearance but the Pacific Wren is darker and both have slightly different calls. They can be found in dense low growth in coniferous forests, woodlands and thickets along the West Coast from Alaska to California. 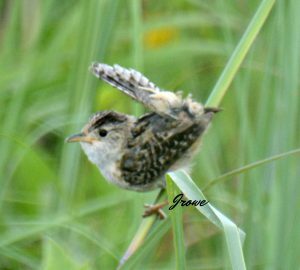 Marsh Wren – (5 to 6 inches in length, small and stocky with a longer bill) native to Mexico, also in Canada, and the United States during breeding season. They can be found in marshy wetlands. 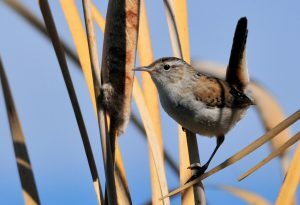 This wren can be hard to find unless you follow their loud buzzy type call and watch for them in the reeds. That is how we usually find them. They stay within the cattails or reeds catching insects on them or on the ground underneath. Sedge Wren – (4.5 inches to 5.5 inches in length with a short bill ) is widely distributed in North America but not always a guarantee to see each year as sometimes this secretive wren shows up in large numbers one year then the next they may not show up at all. It is said that this may because of its wide range of nesting areas and that it just doesn’t like to stay in one area too long. The Sedge Wren’s habitat is grassy marshes and sedge grasses (i.e. wetlands). It feeds on mostly insects found close to the ground. This wren is a little more difficult to see because of its secretiveness. They winter in the Gulf and Atlantic coasts. 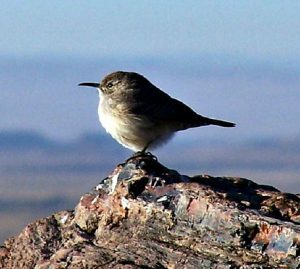 Canyon Wren – (approx. 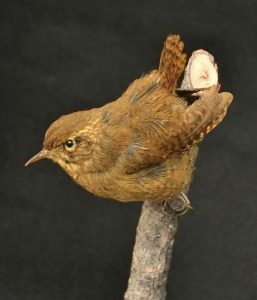 5.75 inches in length, has a dark rufous coloring) this wren can be found in western North America, southern British Columbia, and Mexico. It feeds in narrow rock crevices in canyons and the mountains. You may see one hopping about on rocks as we did in Utah, or along boulders as it feeds on mostly spiders and insects. 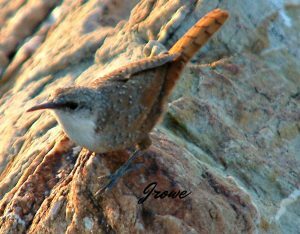 Rock Wren – (approx. 6 inches in length, pale gray coloring) found in western North America and native to South America around rocky canyons either low elevations or high elevations. It feeds mostly on insects and spiders. 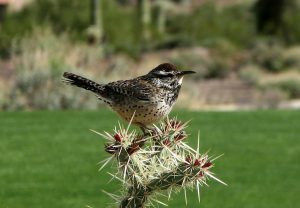 Cactus Wren – (8.5 inches in length with a heavy bill and rounded barred tail) this is the largest wren in the United States found in the southwest and in Mexico in desert areas and arid foothills. They like large cactus and desert thickets. We usually spot this bird coming out of a cactus plant as they like to build their nests in them. They feed mostly on insects. 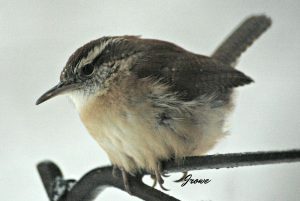 I will be looking for this wren in the next couple of weeks when I travel to Arizona. Bewick’s (pronounced Buicks) Wren – (approx. 5.25 inches in length, with a longer neck and long tail, brown and gray in coloring) found in western North America in thickets, underbrush, and wooded habitats. This wren feeds mostly on insects. It is always a delight to see and hear those cute little wrens. It is hard to believe that such a little bird can carry such a loud, boisterous call. That is usually how you find one too as they are mostly secretive birds. You hear them and then try to follow where the sound is coming from to find them. There are ten different species of wrens that are found in North America. Everyone of these species is just as enjoyable as the next to see in the wild. Well, only if you don’t have to go in tall grasses and get ticks to find one. :-). Posted in Backyard Birds, Birding Vacations, Songbirds and tagged wrens of north america.